Jenna is described as smart and active. Her file states that she likes to help her caretakers, she will put chairs in order before dinner and put them back afterwards. Jenna’s file says she is a fast learner, is very attentive, and can focus in class. Her file says she can say simple words and call the names of her friends. According to her file her favorite foods include bananas and apples. Philip’s file shows he likes interacting in school and playing with his peers. Philips file says that his favorite toys are balls and toy cars. According to his file, he can walk freely on a flat floor, run, and jump. 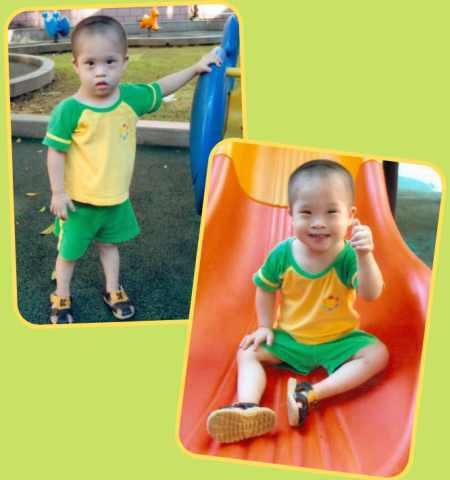 Ishmael is a quiet, well-behaved little boy who loves to play outside. He can stand for a long time with his hands holding something for support, feed himself with his fingers, and he imitates simple words. He wraps his arms around his caregiver’s neck as they move around the room. 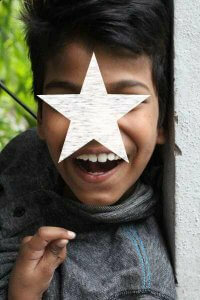 Ishmael is described as a sweet boy who gets along well with other children. 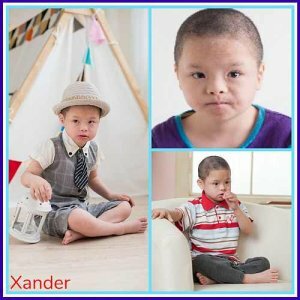 This little cutie pie is Xander, who was born with Down Syndrome. He came into care when he was about six months old, and joined a foster family when he was 9 months old. He is especially close to his foster uncle. Xander can walk unsupported and ride a trike. He loves to play with others and follows instructions. Xander loves to play outside. Paulie is doing his best to grow in all aspects of his life. Paulie can sit up for a few minutes and he is learning transitional movements from sitting to crawling, moving forward on his stomach and using his arms and legs (one of the steps towards crawling). Paulie doesn’t talk yet, but is headed in that direction. He makes recognizable sounds to communicate. These include clicking his tongue to show happiness. This is a new sound of self-expression to communicate and we are excited because it is an effort he makes towards speech! He does not speak words at this time, but he is using more vocal sounds to express joy or unhappiness. Paulie’s fine motor skills are satisfactory. He enjoys playing with toys that hang on strings or toys that can dangle. 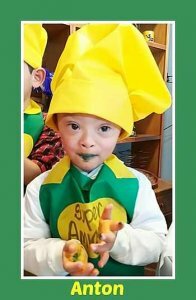 Paulie has Down Syndrome but he is working hard to be all that he can be. He has great enthusiasm for life and an even greater smile! Could Paulie be a part of your family? Paulie’s agency has a $1500 grant for his adoption! 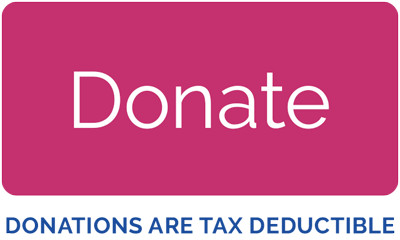 $20.00 has been donated towards the cost of my adoption! 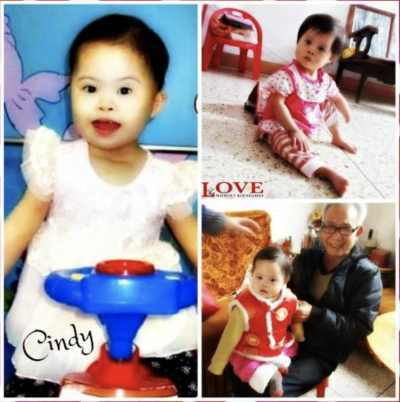 Darling Cindy was born June 2013 with Down syndrome, CHD, and a left wrist deformity. She loves to play hide and seek, and when her caretakers play with her, she is said to laugh loudly and smile. An update from 2016: Rhiannon is a quiet, tiny girl, who appears quite small for her age, and very thin. She has a heart condition, which she has not had surgery for. The nannies say she eats a normal amount, so they are not sure why she’s so thin. When agency staff visited in April 2016, she sat up very stably and was alert, frequently nodding her head and rocking. Caregivers say she doesn’t often reach for toys, but she will react when the nannies make faces or tickle her. She can stand up with support from her nanny under her hands. In the baby walker she can move around very quickly! She will scoot around on her bottom as well to get around, but doesn’t crawl yet. So far she’s not babbling, just making sounds. She does turn to sounds as well. 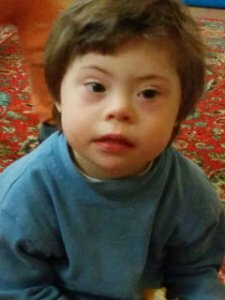 From March 2013: Under the patient care and training, Marcel has more communication with others and the outside world, and he is interested in some toys. Sometimes when he is doing activity on the cushion, he will reach toys on the shelf when lying on back, and makes the toys make sound. And the sound can make him feel happy. He can also get up the objects and toys near hand, and the put them into his mouth, if he failed to get the toy he can move his body to get. He can follow rolling red training ball, and his sight follow the ball to turn. When lying on back he can raise up head for 2-3 seconds, when lying on back he can touch toys on the toy shelf. 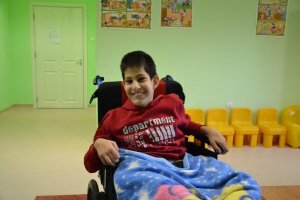 Now he lives happily in this institute, and caretaker takes patient care of him and trains him and forms him some basic motion skills according to his growth. We hope that he can have a family. He is gentle, likes colorful toys. $108.00 has been donated towards the cost of my adoption! 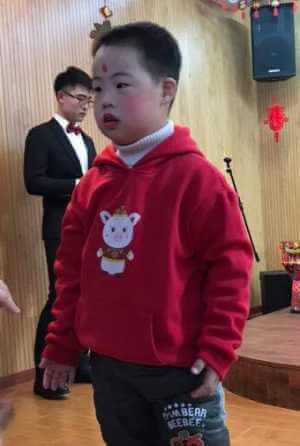 From July 2014: Humphrey is active and likes crowed places; he is obstinate and must do things he wants to do; when in our institute, the caretaker who is liked by him took care of him; in foster family, foster parents take care of him. 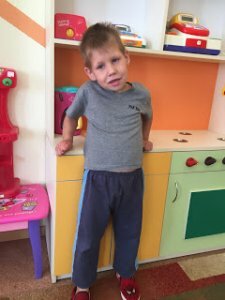 At 25 months old he could make many sounds; could call mama; could clap hands; at 26 months old: could point to or grasp ears when you ask him where his ears were; at 27 months old: we decided to look for a foster family for his better care and development; on May 9, 2014, the baby was officially admitted to foster family; the family liked him very much and bought him many new toys and clothes; the baby adjusted to new life soon; now he attends our rehabilitation trainings every day accompanied by his mom; he can imitate simple motions such as bird flying, clapping hands and raising hands; at 28 months old: through half a month’s training, he could stand with support steadily; he just will not step forward; during training, he always raise his feet naughtily to ask his mom to hold him. The baby is adorable and willing to cooperate to do rehabilitation trainings. We believe through working hard together, he will make greater progress. Kraig’s file was prepared in October 2016, when he was four. 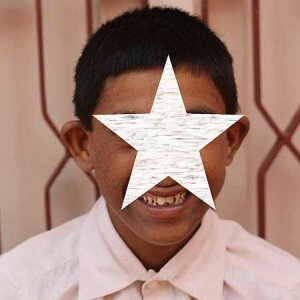 He is described as an introverted child who will also smile sweetly to his caregiver. He will play with other children, but cries loudly if they take his toys away. He likes an electronic keyboard and rubber ball toy, but will play with them less than five minutes. 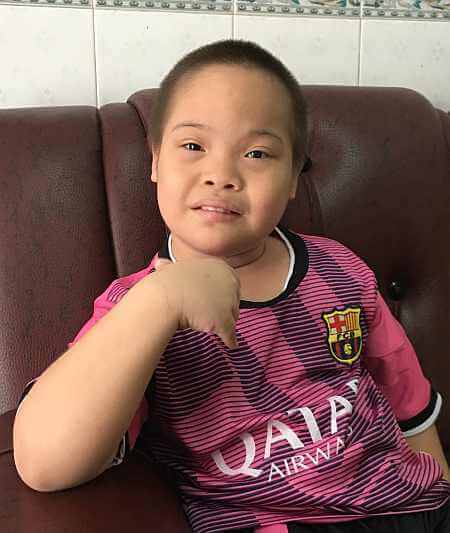 Most recently, at the beginning of 2018, Kraig was at a foster home in a major city receiving medical treatment, but was recently recalled back to his orphanage due to new law in his country, in the Spring of 2018. $20.70 has been donated towards the cost of my adoption! 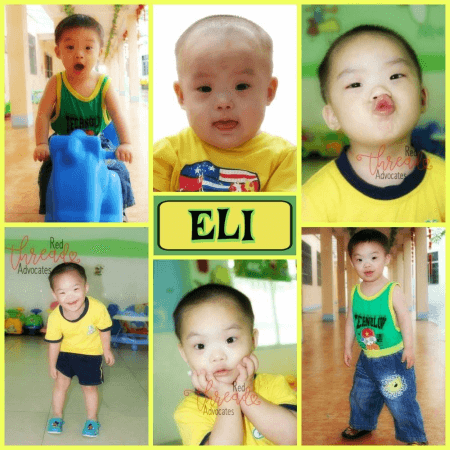 Elijah was born with Down syndrome and a Congenital Heart Defect. He seems to know how to have fun! 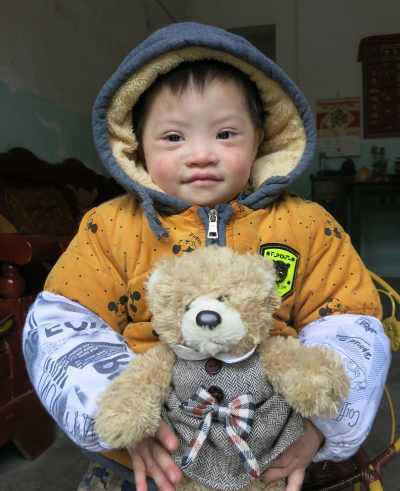 His caretakers describe him as cute, outgoing and delightful, and say he rarely cries. When you hug him and talk to him, he instantly smiles. He loves to listen to music and sing along. 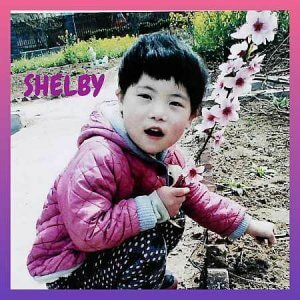 $57.41 has been donated towards the cost of my adoption! 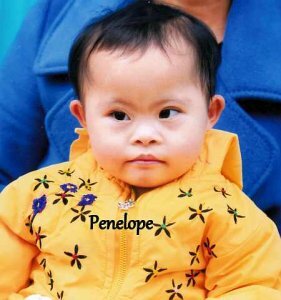 Felicia is a beautiful little girl with a darling smile, born in February of 2012 with down syndrome. Felicia loves to play and is said to be lively and friendly. She is not a picky eater and likes a variety of foods. 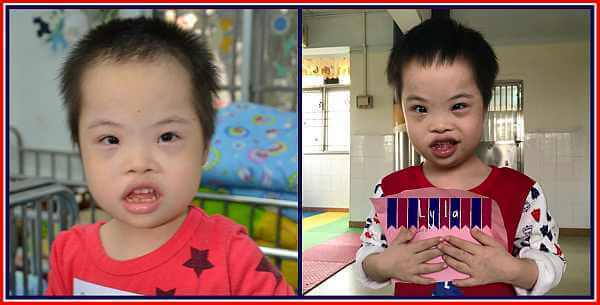 Felicia enjoys playing with rubber balls, colorful toys, and listening to music. Felicia is a happy little girl and we can’t wait to see what family is going to be so happy they said yes to this little sweetheart! 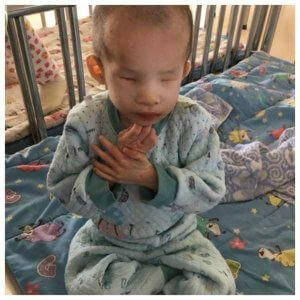 There is a $1,500 agency grant for Felicia’s adoption with a specific adoption agency. $63.90 has been donated towards the cost of my adoption! 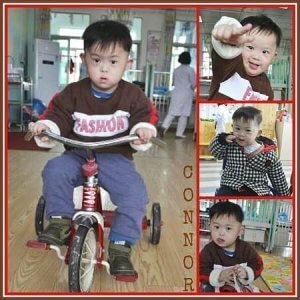 Ronan is a happy and handsome little guy, born in February of 2011 with down syndrome and a congenital heart defect. 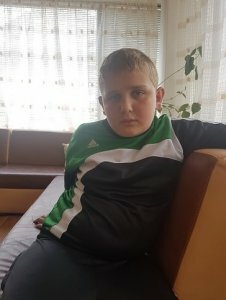 Ronan has had surgery for his ASD. 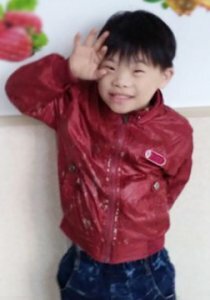 He is living in a foster home connected to the orphanage and he goes to school in a special education classroom in the orphanage from Monday-Saturday. 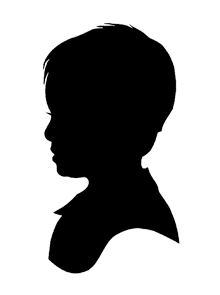 Ronan is an extroverted boy who is positive at school and very interested in new things. He can get along well with his classmates and his teacher and classmates like him. Ronan enjoys playing with toy blocks, drawing, and reading books at home. His favorite tv programs are Boonie Bears and Spiderman. 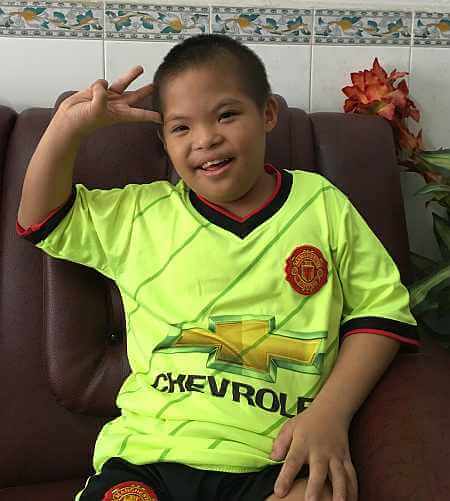 He has good motor and mental development, and has great self help skills. Ronan can put on and take off his clothes, wash his face, brush his teeth, and eat independently. He can also help his foster dad and foster mom clean the table, put the chairs in place, fold clothes, etc. 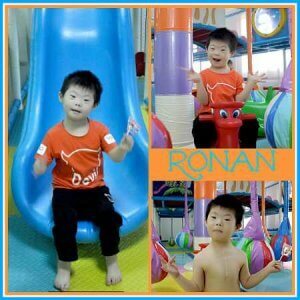 We hope Ronan’s forever family comes forward soon because he’s clearly a waiting treasure! There is a $1,500 agency grant for Ronan’s adoption with his current adoption agency. $364.50 has been donated towards the cost of my adoption! SN: epilepsy – rare seizures, after surgical intervention due to brain tumor – oligodendroglioma in the left temporo-parietal area; at this point he does not have any symptoms, related to the illness. He is active during dynamic games. He rides a bicycle and has good coordination of his body in space. His IQ = 89, which is within the norm but he still has difficulties reading and makes spelling mistakes while writing and re-writing. He communicates freely with children and adults. He completed 7th grade and have an average results. He needs a guidance and support of loving parents. He wants to be adopted and agreed to meet the prospective parents. 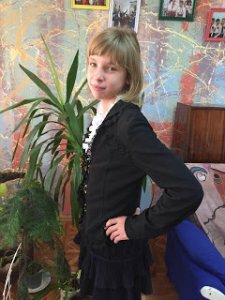 This 11 year old girl enjoys music, dancing, and drawing! She is described as helpful and often helps with the younger children in the care center by changing diapers and helping with mealtime. 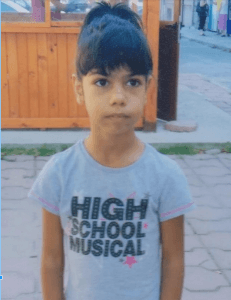 She came into care at 7 years old and birth history is unknown. 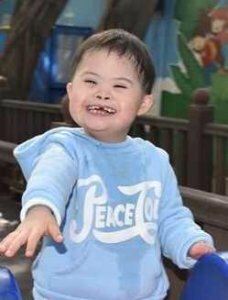 Lainey attends an intervention class for Down’s syndrome children at her institution and then a 1st grade class three afternoons a week in the community. Educationally she is able to write and recognize alphabet letters, copy words, knows numbers up to 50, do simple addition, and is said to have beautiful handwriting. She understands most of what people say and has age appropriate motor skills. Lainey likes to wear dresses and loves anything that makes her look beautiful. 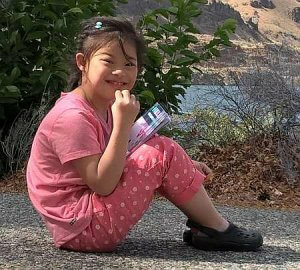 She needs a loving prospective adoptive family that is knowledgeable about Down syndrome and can provide her with excellent access to therapies and education. 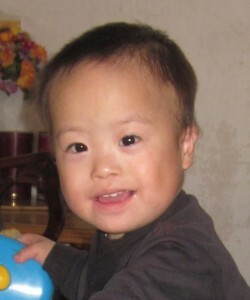 Tyree is a sweet little boy, born in December of 2011 with down syndrome. Tyree goes to class in the rehabilitation and education classroom of the orphanage from 8:00 to 2:00 Monday through Saturday. He is said to be an active and positive boy with a pair of charming eyes. He can put on and take off his clothes, wash his face, and eat independently. Tyree likes to help his foster dad and mom clean the table, put the bowls and chairs in place, and put toys back in the toy box. He is positive at school and is interested in new things. He gets along well with the other classmates and they, along with his teacher, all like him. 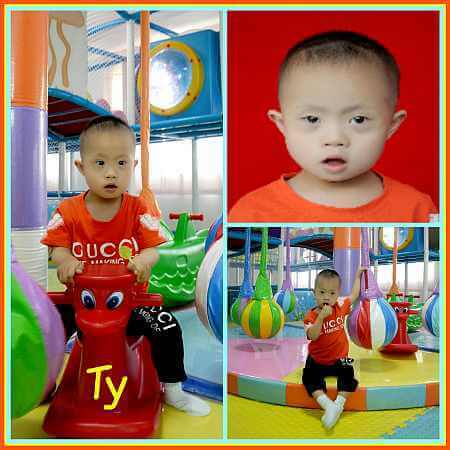 Tyree enjoys listening to music, dancing, and playing with toy blocks and balls. His favorite programs are Spiderman, Boonie Bears, and Pilgrimage to the West. Dancing is Tyree’s specialty though! Tyree’s caretakers note that he has good motor and mental development. We hope that Tyree’s forever family sees him soon! There is a $1,500 agency grant for Tyree’s adoption with his current adoption agency. Intellectual disability. No spasticity. She walks independently but her gait is a bit weak. Social, interactive, beautiful, engaging, loveable child with a sense of humor who loves to laugh. She can feed herself. She has good receptive language in her native language, but is non-verbal. She can imitate some sounds. Enjoys playing with musical toys, toys that stack, toys with small parts that fit inside, trying to trace letters with chalk, and throwing and trying to catch balls. Able to concentrate on one toy for a sustained period of time. Follows directions well. Prefers soft solid foods and favorite food is eggs. Loves the beach. She can go up and down stairs by herself holding the railing. She enjoys being with other people and is friendly with adults and children. 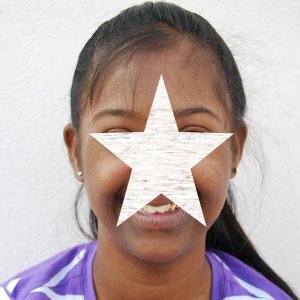 Kristal is learning braille, and wants to be a musician. She also likes science. She’s said to be peaceful, organized, and pays attention to details. She would really like to have siblings. 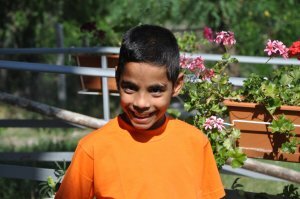 Heart Warrior Grayson is a handsome 10-year-old boy who is said to be positive, active, smart, respectful, and loving. He enjoys sliding and riding the wooden horse out in the playground. Caregivers describe him as compliant, and a talkative child who communicates well. 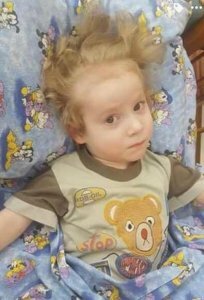 Grayson is diagnosed with congenital heart defects (including single ventricle, double outlet right ventricle, pulmonary artery stenosis, VSD, ASD) and has had three surgical procedures. 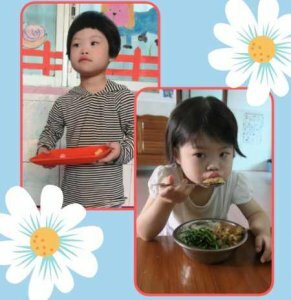 As of his report from August 2016, he can walk freely, go up and down the stairs without support, and feed himself. He brushed teeth and washes his face after getting out of bed in the mornings. 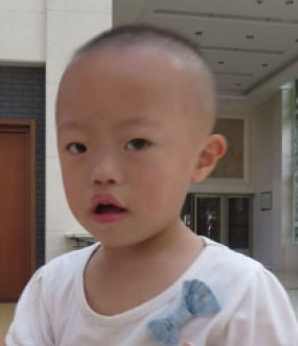 He attends school in the orphanage and is reported to be a smart boy. He was often praised by his teachers and liked to share interesting things that happened in school after he came back to his caregivers. 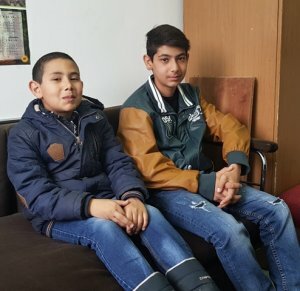 He can sing and read poems and he gets along well with the other children around him. He says he loves the welfare institute and the big “family” there but also hopes to have his own a family with loving dad and mom! Could you be his family that he’s dreaming of? 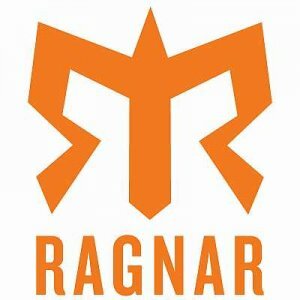 The agency has several videos available. 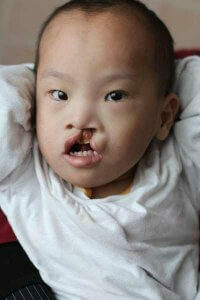 Grayson has a $4000 grant available with his current adoption agency. Mary is a beautiful little girl, born in July of 2008. She is described as sunny and is said to enjoy singing, dancing, playing games, and building with toy blocks. 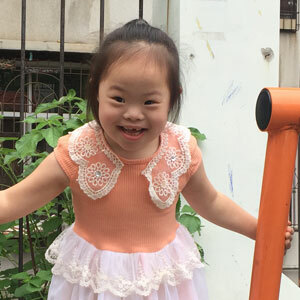 She can say some simple words, such as “thank you, teacher,” “aunt,” “Good morning!” and “I want to eat ___.” Mary likes to learn new things while in her special education class and she will often raise her hand to answer questions in class, despite not being able to give a clear answer. 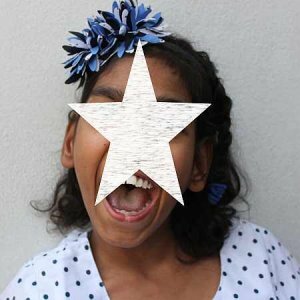 She likes to help her classmates find their seats and will follow along when singing children’s songs during the music lesson or when she hears a song on TV. Mary gets along well with her teachers and her peers. She likes playing with toys with her friends and is good at sharing. She sometimes isn’t the best listener and will smile at the caretaker and do her own thing. Mary has good motor skills. 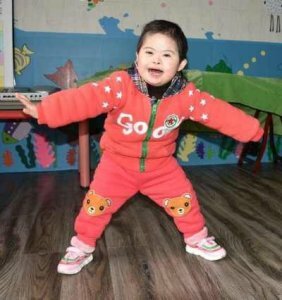 She is able to sit, stand, walk, run, and jump on her own. She is active in PE class. Mary can eat, put on clothes, and wash up independently. She will sometimes help the caretaker fold blankets and clothes. Mary likes to give her morning exercise leader hugs and isn’t afraid to report a child who is not doing what they are supposed to be doing. At night, Mary can take off her shoes, socks, and clothes on her own before going to bed. She is good at folding her clothes and she enjoys sleeping. 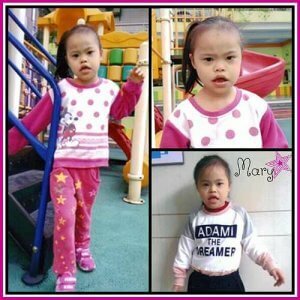 There is a $2,000 agency grant for Mary’s adoption with her current adoption agency. 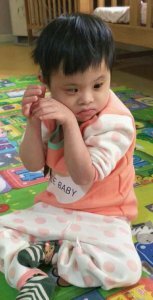 Mary needs a family with an approved home study to be able to hold her file or move forward with adopting her. Julie’s age was estimated. Please check with the agency for further information. Julie is funny and sassy. She is a friendly child and always greets visitors with a big smile and waves them over to say hello. She has good use of her hands and is able to complete tasks such as feeding herself and is working on pre-writing skills. Julie attends an on-site school where she works with her teacher on learning her English alphabet and shapes. She can count up to 5 and identifies basic colors. Julie likes to look at books and play with toys, especially baby dolls and blocks. She speaks full sentences in her native language, and speaks 70 plus English words. She understands most of what is being said to her in both English and her native language. 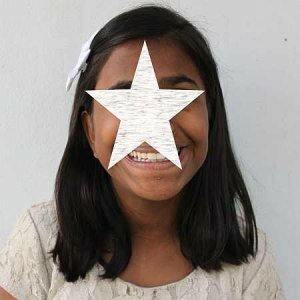 She is bonded to her primary caregiver and gets along with the other children. She loves to hold the babies and play with other children her age. She can sit independently and crawl. She receives physical therapy 3-4 times a week where she working on tall kneeling and strengthening her back muscles. She has recently started bearing weight on her legs during physical therapy with the help of AFOs. Julie is also in the progress of potty training and has been doing really well with this. 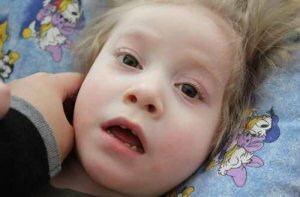 Tricia has a seizure disorder for which she is on medication. She is now seizure free. She also has intellectual delay. She can speak in short sentences in her native languate and uses some words in English. Her speech is somewhat slurred and she has difficulty with social skills, attending to tasks and conversation. 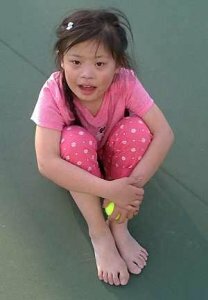 Tricia is a sweet, happy girl who loves dancing, music, and jumping on the trampoline. She loves to be with her caregivers, the other girls in her home, and is very friendly with new people. She is very affectionate. She struggles with writing her alphabet and therefore does not enjoy it very much. 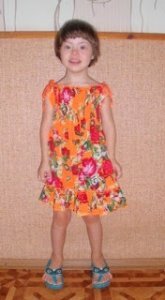 She is interested in fashion and looking her cutest in a pretty dress with a flower in her hair. She has lots of energy to run around and jump up for a hug. She has a sweet voice and likes to show you her work. She is very motivated by adult attention and is learning boundaries with adults she doesn’t know well. She desperately asks for a family. Giada has grand mal seizures (with small seizures (petit mal) or without them), unspecified; congenital malformation syndromes predominantly affecting facial appearance; genetic syndrome – chromosomopathy or monogenic syndrome; facial dysmorphism; psychological and behavioral disorders related to past trauma. More information is available from the agency for interested parents. Giada is on medication for her seizures. 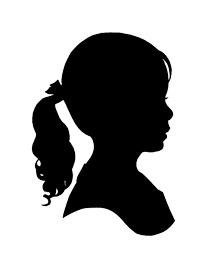 Family history: the child’s biological mother has mental delay, epilepsy- grand mal seizures (she had Depakine during pregnancy) and cerebrovascular disease; the child’s biological father had mental delay and abused alcohol. Giada is sociable and outgoing girl. She interacts and looks for contact with peers and adults. 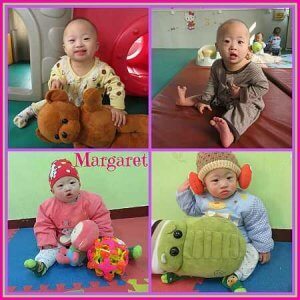 She is able to cooperate with other children from her class. Giada loves to draw and color, as well as to solve puzzles. She prefers to play with her peers or older children. She loves to play with children younger than her so she can take care of them. She cooperates in games. Giada knows what adoption means and she dreams about being adopted and have a forever family of her own. B/c we only have her file for a short time, donations will not be accepted until a family is found for her. 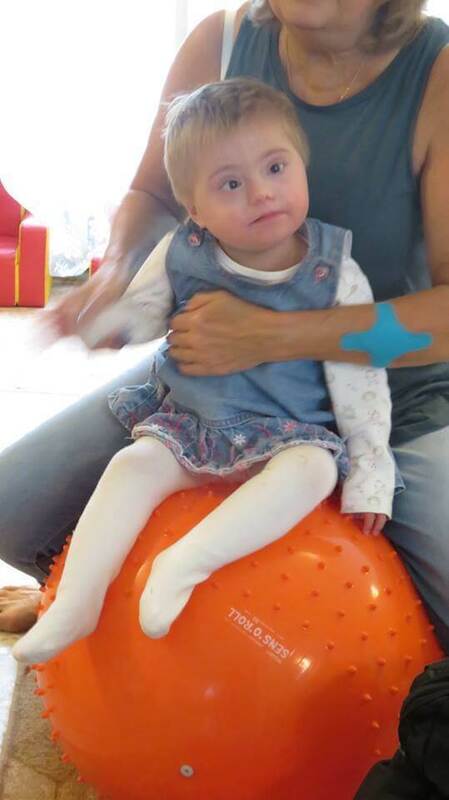 Giada is physically well developed for her age with mild neuropsychological developmental delay. Her Epilepsy (petit mal seizures) is well managed with medication. She has a well developed fine and gross motor skills. She can read and write. She loves to paint and to play sports. She has a well-developed imagination. She attends a public school and is doing very well there. Her dream is to become a teacher one day. Giada is not shy. 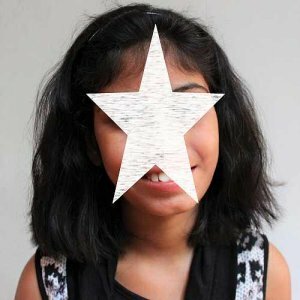 She is able to communicate easily and maintain a dialogue with her classmates and adults. She has good hygiene habits. Lyla likes to smile at familiar people. Lyla’s caretakers describe her as shy and well-mannered. She can walk, get out of her bed, find her bed, and get in her bed on her own. She can drink water out of a bottle, grasp biscuits, and use a spoon to eat. She likes to play on her own with rattles and plush toys. Lyla also enjoys playing happily with another child in a crib adjacent to hers. She likes riding the wood horse and will even move the wood horse out to ride it on the playground. Lyla can play on the slide and can do simple morning exercises, along with the teacher. 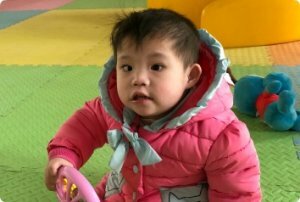 She will watch and listen to anyone talking to her and understands simple instructions, such as ‘put the trash into the trash can.’ She can say “ayi,” “jiejie,” and other simple words. Lyla is not potty trained. Lyla was born with down syndrome and polydactyl of the right thumb. It is clear that she has spent far too much time in a crib, which has led her to be more delayed than most children her age. Lyla needs a family who will get her out, meet her where she’s at, and get her access to the resources she needs to succeed! There is a $1,500 agency grant for Lyla’s adoption with her current agency. Molly has cerebral palsy. She can sit independently for short periods of time. She has a feeding tube to supplement her nutrition and help her gain weight, but she continues to eat her meals by mouth. She likes self feeding with hand over hand support. She is potty-trained using a Rifton chair. She tries very hard to communicate using limited sign and speech. She has an eye gaze-controlled computer which allows her to communicate with others. Molly is laid back and content. She loves to be included and likes being silly and goofy. She is very intelligent but has a difficult time showing what she knows given her communication limitations. Knows her English alphabet and can read simple words. Can spell her name. Enjoys playing games (she is competitive) and listening to stories (she can recap the plots of simple stories by selecting images that correspond with the plot). Likes to color. Enjoys being social and playing with other kids, especially make believe (baby dolls are her favorite). Jan 2019 Update: In March 2018, due to increasing hip pain and subluxation of her hip joints, Molly underwent a major double hip surgery: femoral derotation and osteotomy to correct the alignment of her hips and femurs. She was in a spica cast (immobilizing her hips and knees) for over a month. She then spent much of the year re-gaining the strength and movement that she had lost while immobilized. She is a fighter and persevered through significant discomfort over the past year. She maintained her joyful, sweet spirit throughout! Molly celebrated her 12th birthday in December. She was very excited to receive a new traditional dress for the occasion and to get henna designs drawn on her arms. She loves getting fancy and looked so gorgeous! Molly was also very enthusiastic about her cake as she loves all sweets. 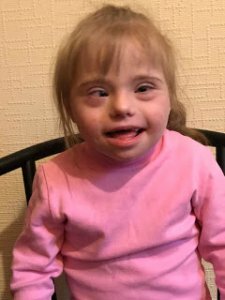 Over the past year, Molly developed a new interest in make-up and will request to wear it by reaching up and rubbing her hand on her lips and cheeks. She also was introduced to the movie “Frozen” and it has become a favorite. She will “sing” (vocalize) along to favorite songs such as “Let it Go”. Molly may not stand out as one of the youngest or one of the sickest, but she is so worthy of a family. She would be a beautiful addition to a family and a beloved daughter, sister, and cousin. Dinah is giggly, likes to snuggle, sweet, content. Will play with toys, seek out preferred toys, and seek out preferred children to play beside. She has been working on using a simple voice-output communication system to greet the other children and choose between two toy options. She is social and gets very excited when surrounded by lots of people. She likes to do what the other children are doing. She can follow simple commands in English and can identify body parts by touching them when asked. She shows ability to build strong attachments and follows her preferred caregiver and opens her arms for a hug. She loves to dance and immediately stands up and starts dancing when music comes on. 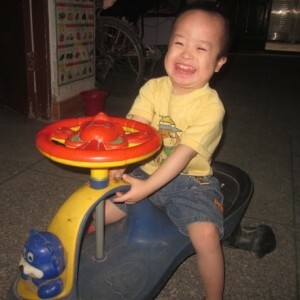 Daylan is a social, happy, enthusiastic, intelligent boy who loves to play with toys, other kids, and adults. He is quite communicative despite speech challenges. He appropriately and spontaneously uses modified sign language for water, eat, more, and all done. He also communicates through vocalizations, facial expressions, and gesturing. Has a customized wheelchair. He independently rolls and scoots around on the floor. He can sit independently with back support and is working on sitting independently without support. He can walk with someone holding him at his arms and can stand holding the railing for short periods of time. 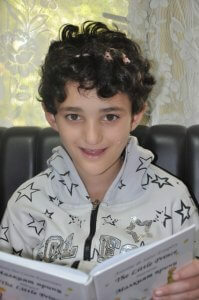 Daylan is a hard-worker and very motivated to participate in activities and perform as independently as possible. 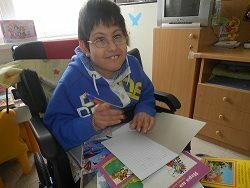 He attends onsite school 5 days a week and he loves to learn. 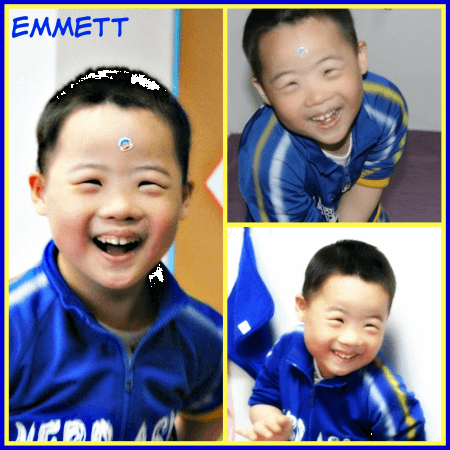 He is a joyful, amazing kid. 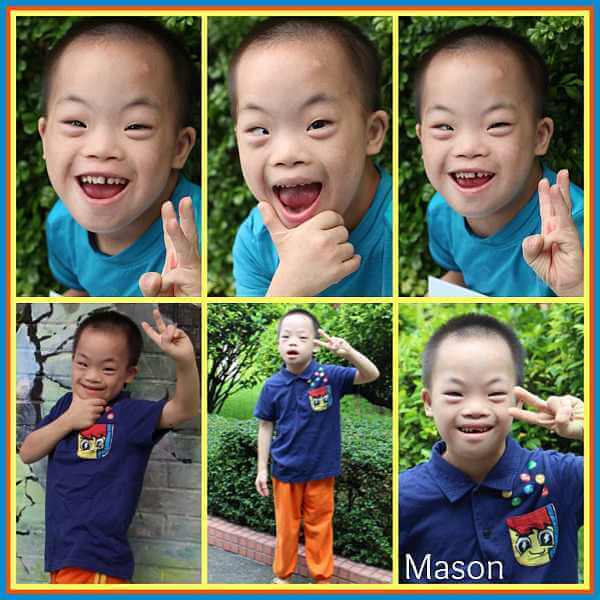 He has a great sense of humor and enjoys making others laugh by sticking out his tongue, tickling, and acting silly. He knows his colors and can point to the correct color when asked. He can identify numbers 1 to 10. He has a lot of potential to learn. December 2018 update: Daylan can now sit independently for a short amount of time without back support and can stand holding onto a railing for minutes at a time. He has a good understanding of the English language and can respond to many commands. He is very motivated to learn. He is able to spell his own name and can identify most letters of the alphabet by pointing when asked. He is now working on identifying the sounds of each letter and spelling other simple words. Daylan is very social and loves to meet new people. He is a happy child, always finding reasons to laugh and to make others laugh. 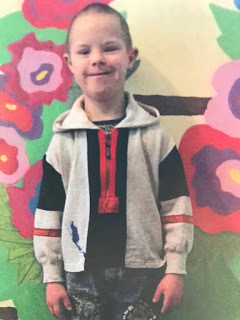 Some of his favorite activities are going on adventures, playing on the trampoline, swimming, and learning to ride an adaptive bike. Striving to be as independent as possible, he likes to brush his own teeth, put gel in his hair, and self-feed large food items. He is an amazing kid with so much potential to grow. Video available! Tabitha is a cute and quiet little girl! 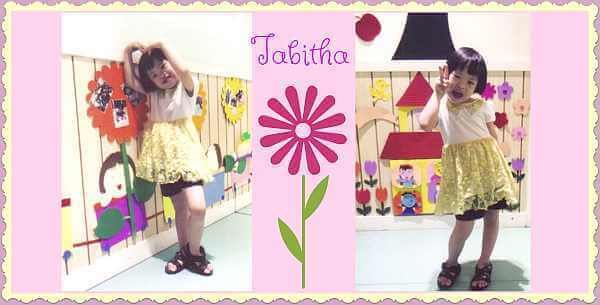 Tabitha can speak short sentences and interacts well with her caretaker and her teacher. She gets along well with the other children and likes to help put the chairs in their place, collect notebooks, etc. 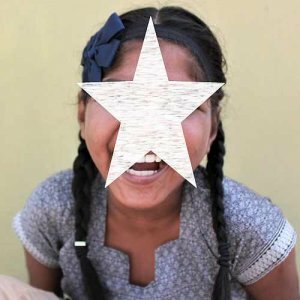 She is independent in her care – able to eat, wash her hands, put on and take off her own clothes and shoes, etc. She is in the pre-school class at the Sunshine school at her orphanage. Tabitha recognizes the numbers 1-10 and can count to 5. She is not a picky eater and is a good sleeper. 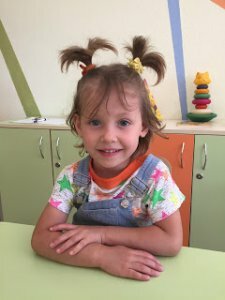 Tabitha likes playing with balls, scooters, toy cars, singing children’s songs, and reading books. Tabitha is a high functioning young girl. She has no temper and is quiet and easygoing. She gets along well with other kids and can follow most commands. She is potty trained. She can feed herself, however, she needs some help to put on clothes. She can say words like, “ayi”, “jiejie”. She can learn and likes drawing. She can sing songs. 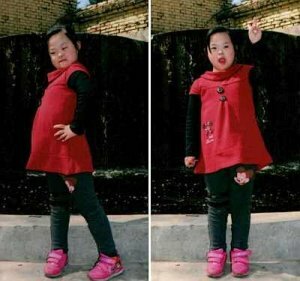 Overall, she is an easygoing, high functioning child with Down Syndrome. There is a $1,500 agency grant for Tabitha’s adoption. 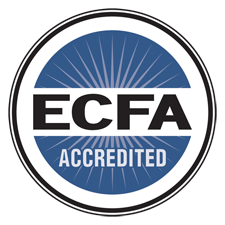 Esther speaks her native language fluently and understands some English. 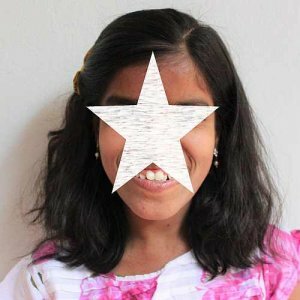 Her sentences in both languages are not clear and she needs the support of a speech therapist. She is on medication to control seizures and is seizure free. She tends to have trouble concentrating and attending to conversation. Social skills are delayed but she is well liked by the other girls and plays nicely. She has memorized her alphabet and numbers 1 to 200. She is writing four letter words neatly. She thrives from having adult attention and asks desperately when her family is coming. She is learning appropriate boundaries with strangers and tends to request hugs from any adult. 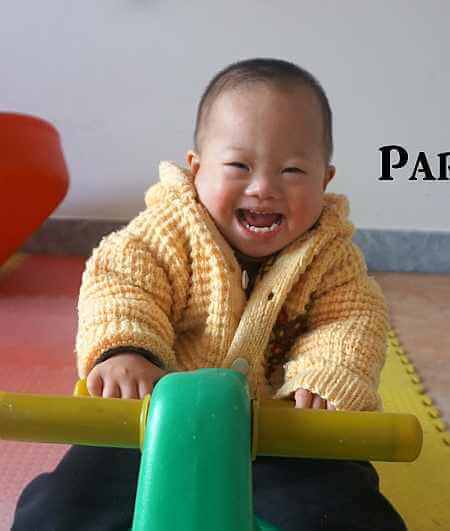 Esther likes jumping on the trampoline, cuddling with caregivers, coloring, dancing and singing. 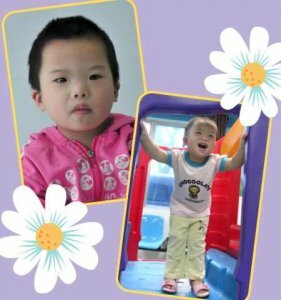 Esther likes to be active with the other children in her house, but she also is comfortable entertaining herself with books and other quiet activities. 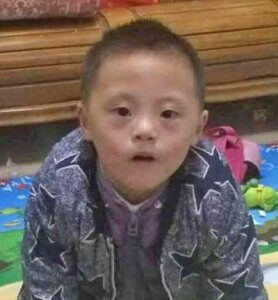 Down Syndrome, myxomatous mitral valve, mild TR, tends to be very healthy, good tone, needs speech therapy. Naomi can identify colors and body parts. She can speak but her articulation is poor and speech is not very clear. She strings together 3-4 words in both English and her native language. Psychological evaluation in September 2015 reported a mild intellectual delay. She can write letters, numbers, and shapes. She comprehends reasonably well and follows simple instructions. She is independent for self care. Quiet, friendly, comical, obedient, sweet-tempered, hard-working. Naomi Has a unique fashion sense and likes to choose her own outfits. Naomi attends on-site school. She knows all of her uppercase and lowercase letters and can write them. Her handwriting is very neat. She can copy write numbers 1-10. She is very quiet but is most talkative during games of her choosing. She is not clumsy and does well and is independent with sports/games night with activities including basketball, hula hoop, 3 legged race. Beautiful Leia! This sweet little lady has grown and developed well over the years. Leia is a friendly girl, eagerly greeting those she knows. She does have some wariness among strangers, though. She has good self-care skills, including feeding herself and washing her hands. She helps with simple chores, and also speaks in sentences. Her favorite thing to do is draw. Staff reports that she has a great capacity to learn. At her facility, Leia receives therapy for language and motor skills twice daily. Leia is a pretty girl who was very eager to come play when our staff visited in April 2016; she hovered nearby while they talked with other children trying to patiently wait her turn! 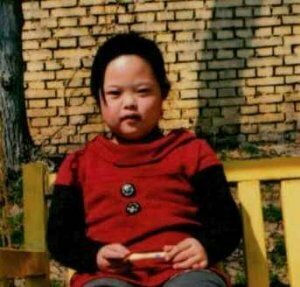 She is diagnosed with Down syndrome, and they learned from staff that she had surgery for a heart murmur in 2014. 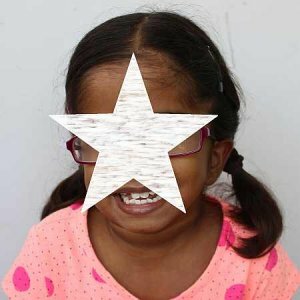 They observed nystagmus but the caregivers report it doesn’t seem to affect her vision in daily life. 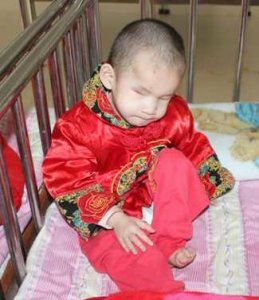 She also has some facial paralysis on her left side, but this was already the case when she came to the orphanage so they don’t know the cause. She was very focused when playing with the toys, and quickly figured out the stacking cups. She did fairly well on the shape sorter, though sometimes she had to try a few times to find the right match. She needed to be looking directly at the lid with the shape holes (straight on) in order to use it. She receives lessons at the orphanage, and is able to point to some colors when asked, but can’t yet count. She tries to put words together in sentences, though her speech isn’t clear. She gets along well with other kids, and loves to hold the babies! 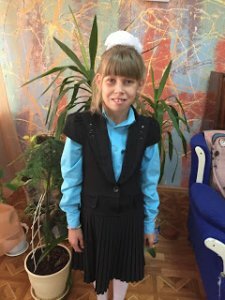 Allison is a beautiful, giggly girl who lives with a foster family in Eastern Europe. Allison is an active child. She runs, jumps, catches a ball with two hands or kicks it with a leg, and climbs and descends stairs with the support of a railing. Allison likes to connect with others, is interested in other children, and includes them in her games. She enjoys playing with dolls and likes to show others all her toys. Allison enjoys the extra attention she receives from her foster parents. Allison is physically healthy. She is eating well, and her weight and height are catching up with the standards for her age. She has some developmental delays that her caregivers attribute to early neglect and lack of stimulation. Allison has difficulty pronouncing some words, and her learning is below the norm for her age. 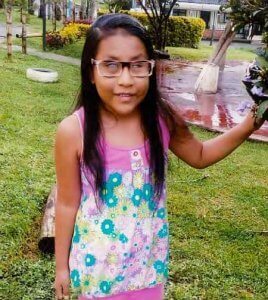 She was in first grade last school year, and the foster family said she loves to go to school. Adelyn is a precious girl who joined a foster family when she was a year and a half. Adelyn is close to her foster mother and plays with her foster brother. She can jump, go up and down stairs on her own, catch a ball, and skip. She speaks in sentences, understands concepts such as in and out or big and small, and can she can count to ten. Adelyn can be stubborn at times, but she can also follow directions and help out with chores. She loves to sing and dance. 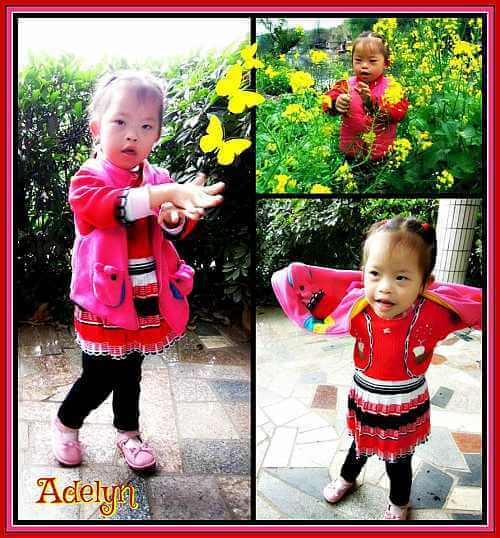 Adelyn was born with down syndrome, but has no other medical needs. This sweet girl is full of personality and ready to come home to her forever family! Adelyn has a $5,000 agency grant for her adoption with her current agency. Video available. 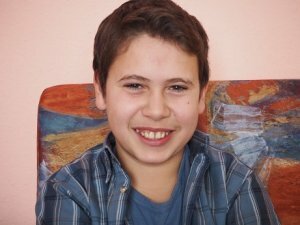 Magee is a boy who is living in a Child Center in Eastern Europe. 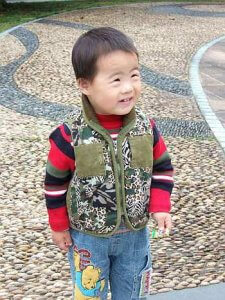 Magee witnessed other adopted children from the child’s center moving abroad with their new families. 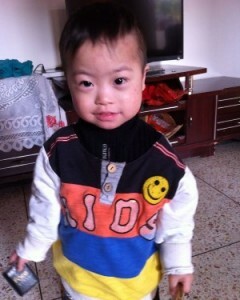 To be adopted and have his own family and home is his greatest dream. 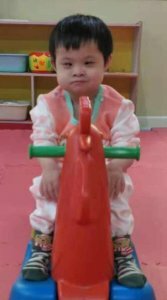 Magee is physically well developed for his age, but he has some developmental delays attributed to his time living in an orphanage. Magee has a good appetite and can eat by himself. He has established good personal hygiene habits and sleeps peacefully. Magee demonstrates affection for loved ones. 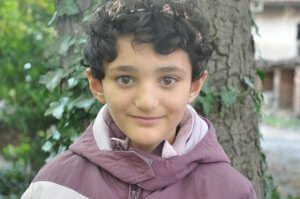 He interacts well with peers and adults and has established friendly relationships with the children from school. Magee likes to go to school and works independently and willingly. 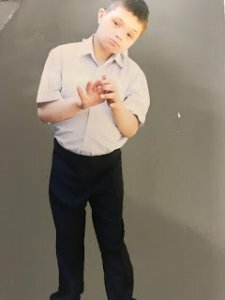 Apert syndrome, craniosyntosis (frontal skull reconstruction done, midface advance needed, would be best done in the US), syndactyly of feet and hands (fingers surgically separated–has 4 digits on each hand). Rebekah feeds herself independently and calls people by name. She can identify objects and colors. 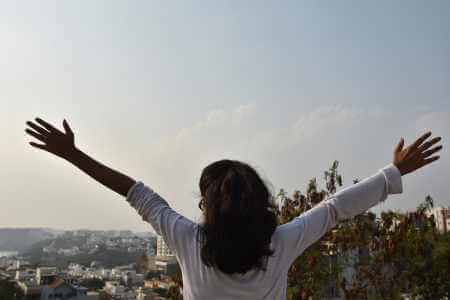 She is independent in indicating her needs and independent in her self care. She is attending on site school where she can write numbers 1 to 200. She loves counting things. She knows and writes all of her upper and lower case letters. She is reading and writing 3 letter words. She can spell her name.She doesn’t want to miss out on what is happening, she is eager to be a part of the fun. She enjoys sitting with adults and telling stories. She loves to color, draw and write. She is proud to be a helper and to be independent. 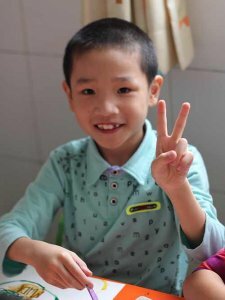 She is working on pre-vocational skills of washing dishes and sweeping and fine motor skills like beading, threading, and cutting with scissors. She is well liked by all the staff and is helpful in the home. She has several very close friends with whom she gets all very well. Alan just turned three years old, and although he can stand by himself and crawl all over the furniture, he is not quite yet able to walk. 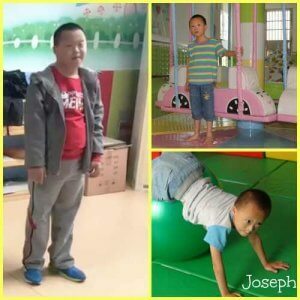 His foster father has been taking him on tricycle rides to strengthen his legs and improve his balance. Alan seems to be enjoying himself immensely! Alan is speaking some family words such as “mama,”, “uncle,” and “sister” and is learning his colors and how to build a tower. Also, Alan can turn the pages of a book and is quite curious. Based on our reports, we can just imagine this handsome little guy snuggling on the lap of a mom or dad of his very own and read book after book. He will surely be a happy addition to some very lucky family! Alan has truly blossomed! He is very smart and also very clever! 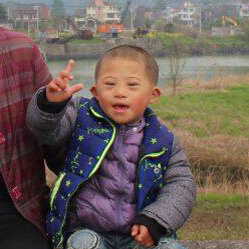 With his foster mother’s assistance he can count to ten; she is also teaching him colors and shapes. With his new found knowledge, Alan believes he is now a teacher and he can often be found teaching his younger foster sister a school lesson. One of Alan’s favorite things to do is to play outside. Although he wishes to play outside everyday, he knows when it rains he has to stay inside and always lets his foster mother know this. Alan has great physical strength and he can run and jump. His favorite game to play is hide and seek. Alan is also a little ham and whenever the camera comes out, he will stop what he is doing and pose. He also has some pretty impressive dance moves. As soon as the music starts playing he will start dancing by shaking his hips. $4,783.00 has been donated towards the cost of my adoption! Aria is able to walk by using a mobility aid – a walker. She can go up and down the stairs while holding onto the railings. She can maintain a sitting position while sitting on a chair, even without seat restraints. Aria is emotionally stable and has adequate emotional responses in different situations. She enjoys being the center of attention. Aria names animals, fruits and vegetables, counts up to 10, says the alphabet with some help from an adult, and names the children and the staff members by name. She participates in group activities with other children. She is sensitive to the other person’s emotional state and observes his/her reactions. Aria enjoys looking at children’s books and recognizes the familiar objects and animals on the pictures. Area eats common food independently with a small spoon or fork.The child drinks from a cup. Due to her physical disability, she cannot bath herself independently. She goes to the toilet on her own. The child washes her hands and brushes her teeth on her own. 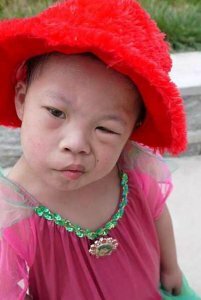 Gabriella has Down syndrome and had surgery for congenital heart disease (VSD). A recent echocardiogram was normal. She came into care when she was a baby and joined a foster family in 2014. She gets along well with her foster family and is especially close to her foster father. She brings him his shoes when he arrives home from work and plays games with him. She can say a few words and knows how to greet the neighbors politely. Gabriella is a curious little girl who likes to play outside and gets along well with others. 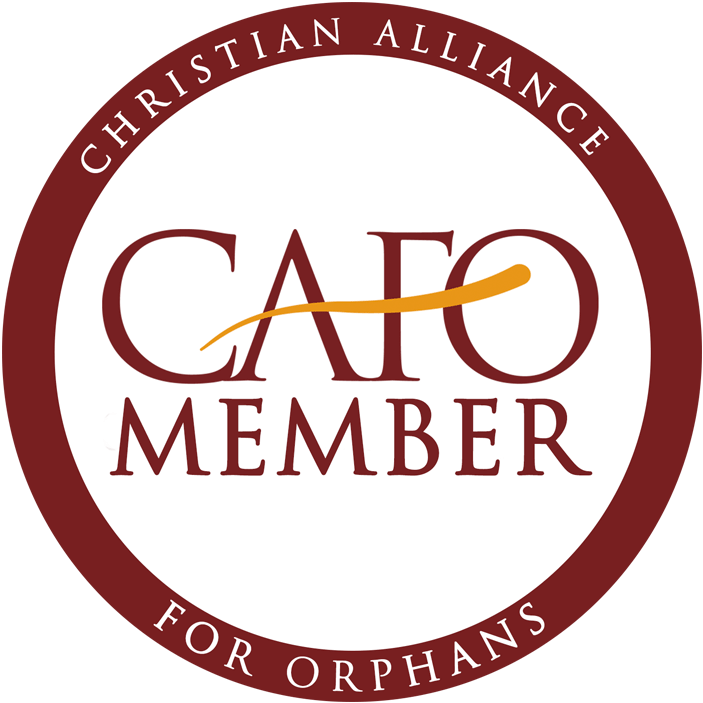 $1,200.21 has been donated towards the cost of my adoption!